Uncoloured lithograph of a panorama of Calcutta drawn after nature by Frederick Fiebig and prepared, printed and published by T. Black of the Asiatic Lithographic Press in Calcutta in 1847. The second section shows the large green space of the Maidan between Fort William and Government House. The grounds of the Calcutta Cricket Club can be seen in the centre left. 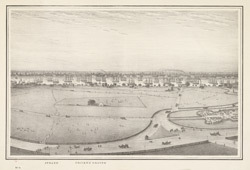 Since 1864, the Cricket grounds have moved closer to Eden Gardens, shown on the right. The Eden Gardens were laid out in 1834 and opened to the public in 1840. They were named after Emily and Fanny Eden, the sisters to Lord Auckland, the Governor-General of India from 1836-1842. Shipping on the River Hooghly may be also seen in the middle distance of this view behind the Maidan.